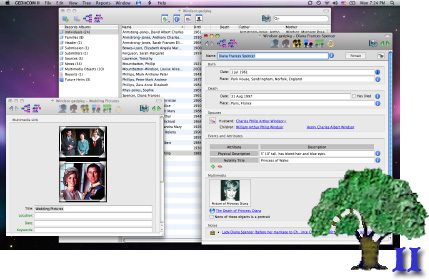 GEDitCOM II is a genealogy application for MacOS X that sets the standard for ease-of-use, for editing genealogy files, for a customizable user experience, and for power features allowing the greatest access to your genealogical data. GEDitCOM II is a complete rewrite of the former GEDitCOM application. A new mobile app companion called GEDitMobile lets you view your genealogy data from GEDitCOM II on mobile devices. Review the features of GEDitCOM II. Then, Download a free demo to try out those features, including importing your genealogy data from another application. When you are ready to buy, simply purchase a license that will unlock the demo version you already downloaded. If you choose not to buy, GEDitCOM II will switch to a free "reader mode" you can use to view GEDitCOM II files or to open genealogy GEDCOM files created by any software. You can still purchase a license and it will convert the "reader mode" back to the full version. Users of the GEDitCOM application (which no longer works because Apple has deleted the "Classic" environment) cn switch switch to GEDitCOM II for only $19.99. To see all the new features in action, download the demo and open any of your previous GEDitCOM files. Your old files are 100% compatible with the new GEDitCOM II. GEDitMobile is a mobile app companion for GEDitCOM II (coming soon). We hope you will "Like" the new GEDitCOM II Facebook Page. "We are all nobly born; fortunate those who know it; blessed those who remember." See the Date Calculator utility for a MacOS X application that does genealogical date calculations. It is free with purchase of GEDitCOM II.